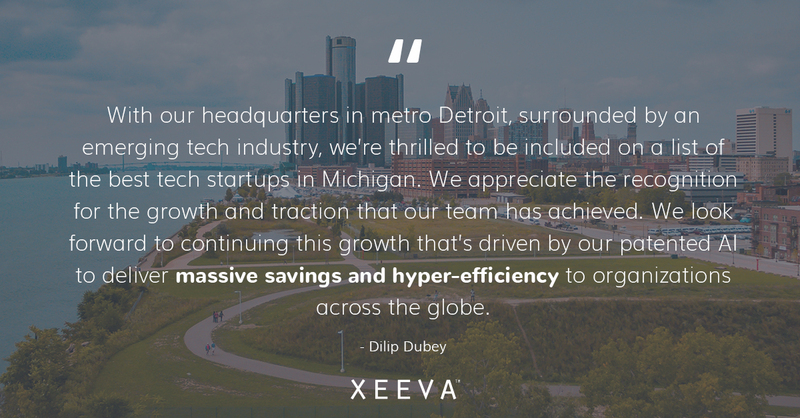 MADISON HEIGHTS, MI, February 5, 2019 – Xeeva, Inc., a global provider of AI-powered procurement and sourcing technology, has announced that it was listed on The Tech Tribune’s “10 Best Tech Startups in Michigan” for the second time. Focused on delivering technology, news, articles, and insights, The Tech Tribune annually compiles lists of the best tech startups globally. Its staff considers the following factors during its research: revenue potential, leadership team, brand/product traction, and competitive landscape. Additionally, the publication requires that each of the qualifying organizations be independent, privately owned, less than ten years old, and have received at least one round of funding. Xeeva has been experiencing rapid growth recently between its $40 million funding round last year and countless awards and recognitions over the past few months, including winning Levvel Research’s “Innovative Procurement Technology of the Year” award and being named a Gartner Cool Vendor for Procure-to-Pay Applications. To see The Tech Tribune’s full 2019 list of best tech startups in Michigan, click here. If you’re interested in joining Xeeva’s team, check out their open positions here! Founded in 2017, The Tech Tribune delivers the latest technology news, in-depth technology articles, and insights on the hottest technology startups all over the world. Their flagship journalistic endeavor is their Best Tech Startups series that they publish for every major city in the world. Founded in 2014, Xeeva is leading the next generation of procurement and sourcing software. Its full suite source-to-pay solution does more than just improve processes, it transforms your business – allowing you to truly see more, do more, and save more. Uniquely built with patented AI at its core, the power of its advanced technology is integrated throughout the entire suite to drive actual results across your organization. Xeeva reveals insights no other solution can see, eliminates tactical and tedious procurement tasks, and generates immediate bottom-line value in places you didn’t even know to look. For more information, visit www.xeeva.com.